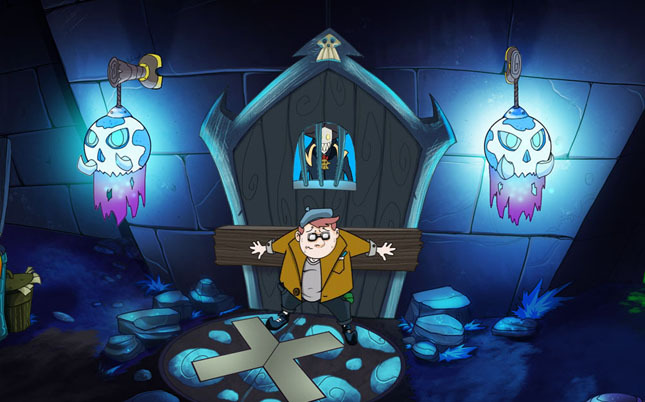 Darkestville Castle is a point-and-click adventure title tinged with dark humor where you must complete puzzles to progress further. You play as the villain and owner of the castle, Cid the demon, who enjoys performing evil deeds on the innocents. Dan Teapot, his enemy, stands in your way. This adventure is replete with puzzles you must solve, mostly, you find necessary items and determine their proper usage. Although this isn’t a genre I play much, I had more fun than I originally expected, between the humor, art style, and setting — although it was frustrating attempting to solve these puzzles. The prelude is a breeze in comparison to what comes after, which was an uphill struggle, perhaps because after the prelude, you have access to several new places and aren’t limited to your castle. There are times in which you may be unsure of where to look next or on what you may click. This is when chatting with others proves helpful; for the latter issue, there’s a button in the upper-right corner that shows everything in the current room that is clickable. You have three options when interacting with an item or person: you may talk to, look at, or grab. Other objects might have a search or open option as opposed to a grab option. Grabbing a particular item that is necessary to progress through the story puts that object into your inventory for later use. Talking with a person may bring up a dialogue where you have several choices of what to say. This is how you obtain pertinent information from others on how to proceed in the story and where to go next. Attempting to chat with an inanimate object prompts the response from Cid: “I can’t talk to that.” Though, he will talk to his teddy bear, Mr. Buttons. The inventory is straightforward to use, but to switch to try a different object or put an item back you must open your inventory and click on that item. If you’re trying several items at once in the hopes that one does work, cycling through your whole inventory might become time-consuming. But, you can put away an item with a right-click. This prevents an accidental attempt at combining two items when that’s not what you want. I found myself stuck not infrequently and wandered around aimlessly in the hopes that I’ll stumble across something that works. I likewise found myself simply clicking on anything and everything. It felt nearly a chore to uncover a solution. This is, in part, due to the solutions to the puzzles not being exactly intuitive, which induced frustration. If you examine your items, occasionally there are tips to clue you in on where you might need that item. Your first task is to remove Dan, who’s trapped you inside your castle by blocking the entrance. If you’ve ever had an annoying neighbor that, for whatever reason, takes issue with what you do in your personal life (nevermind the fact that this involves wreaking havoc on innocents in Darkestville), he is that neighbor. He stops at nothing to ruin your fun and gives off the vibe of making your life hell. He stands above your trap door and is well aware of this, but he sabotaged your trap mechanism, so he isn’t worried. You have to repair the trap before you can proceed in your adventure. 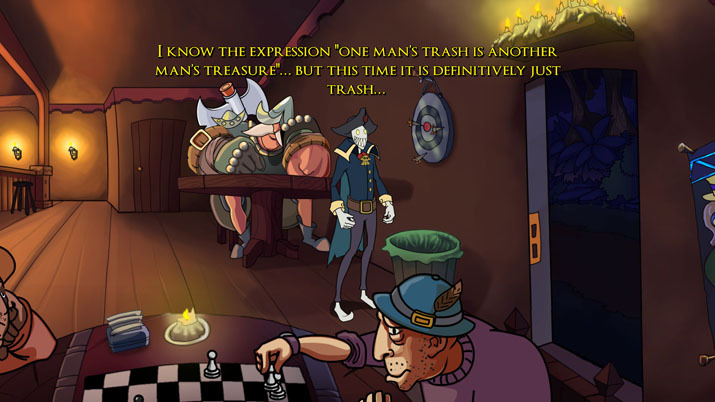 The structure of the dialogue is such that it’s hard not to sympathize with Cid and use the trapdoor on Dan. Dan blocking the entrance was just a ploy to stall you — he hired demon hunters to go after you. But, when they arrive, you’re outside, and they believe you’re Dan, prompting them to search inside until they find their demon. They end up taking your fish. At this point, you may access the world map, searching for ways to recover your pet. It’s locked away in a chest with three locks; the Romero brothers each hold a key, and it’s up to you to retrieve the key from them. Not knowing where to proceed next dampened any sense of accomplishment I felt when I obtained a key. Cid says he commits evil deeds, but they’re just pranks. He feels insulted whenever someone calls what he does a prank. One instance is lubricating an area to have a person slip. Perhaps that person broke a bone or two from the impact of hitting the ground, perhaps not. Either way, this act remains within the realm of a prank; it isn’t demonic by just about any standard. The art style combined with these acts make this title more family-friendly than Cid’s claim of evilness would have you believe. Perhaps this disparity is for comedic purposes, but I’d hoped for a display of evil, to see what he’s capable of and because that’s the character Cid portrays, but ultimately he falls short of living up to this persona. Despite that I’m not too familiar with the genre, I enjoyed myself. But, this fun declines during bouts of frustration, which were too frequent. Once you do solve a puzzle, you might feel elation and relief, but only momentarily, especially if it’s not immediately apparent how overcoming that section helps you proceed further — I felt like I had reached a dead end at these moments. If you are a point-and-click enthusiast and enjoy struggling through convoluted puzzles to progress the story, then perhaps you’ll enjoy the challenge of Darkestville Castle.